The 'Marriage at Cana', started in 1922, is the principal painting produced by Knights during her time at the British School at Rome. It depicts the miracle of the water turned into wine, (related in John 2:1-12). The setting for the painting is the Borghese Gardens adjoining the British School at Rome. The setting is also reminiscent of the background devised by Piero delta Francesca for the fresco of 'The Adoration of the True Cross' in the Church of S.Francesco in Arezzo, visited by Knights prior to starting work on her own composition. 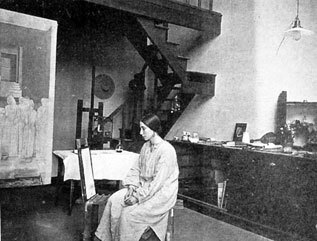 The artist includes herself among the guests, along side, in the earliest studies, Arnold Mason. 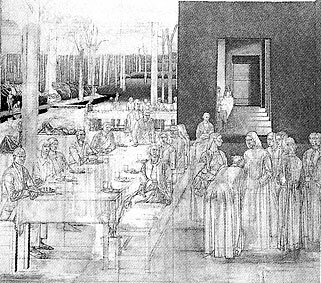 Tom Monnington, who did not arrive at the British School at Rome until 1923, is included in later studies at the far end of the table, in effect next to Mason. As known rivals over Knights they clearly made an ill-suited pair for a marriage feast and Mason is subsequently omitted from the final composition.